Tencent WeStart (Hong Kong) provides digital entertainment startups and entrepreneurs with a gateway to China and springboard to the world via strong cross-border resources and network! Leveraging Tencent's ecosystem, valuable insights and resources across their different platforms such as Tencent Open Media Platform and Tencent Video, we help facilitate startups’ growth and successful expansion into the China market. Registration begins at 6:30pm. RSVP to save your seat! 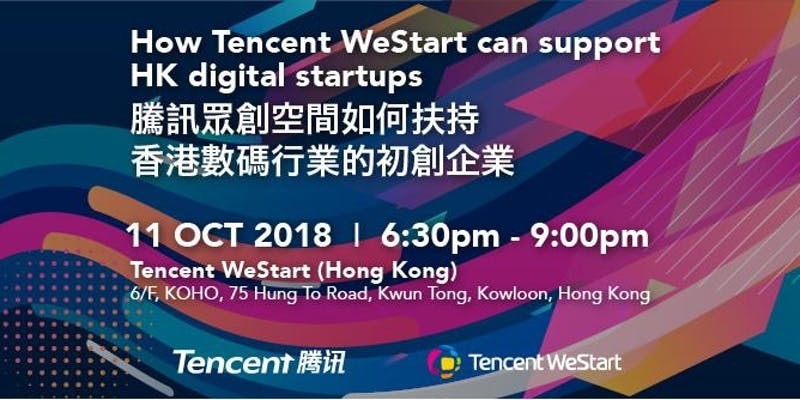 Co-established by Tencent Open Platform, K11, and VS MEDIA, Tencent WeStart (Hong Kong) is the first overseas establishment of China’s leading startup community and entrepreneurial ecosystem. This creative hub focuses on the digital entertainment industry, providing entrepreneurs with a gateway to China, industry knowledge, networking opportunities, resources, funding, specialized production facilities, and access to a regional community of creative minds.